Imagine having to pay a bribe in order to register your marriage, get a passport, report a crime or even to claim on your medical insurance. These are just a few examples taken from over 20,000 stories shared online on the Indian website, ipaidabribe.com. Similar stories of petty bribery can be heard in Greece, Zimbabwe or Mexico. Indeed, one in four people worldwide are faced with demands for bribes to access public services. The bribe giver goes scot free and will be able to collect his bribe money back. The bribe taker on the other hand, loses the booty of the bribe and faces a hefty punishment. Legalisation or empowerment? 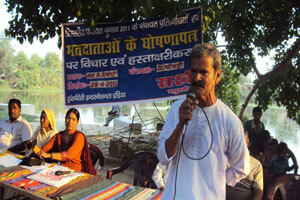 Transparency International India helps local communities organise against corruption. See more photos below. Partial legalisation may not be the fool proof corruption buster that Basu envisages. His reasoning is simple, but his argument doesn’t add up. The problem is not getting people to report corruption. 140000 people have reported corruption to our legal advice centres, and 75 per cent of people say they would report an act of corruption. The problem is what happens when corruption is reported. The problem is impunity for those who bribe. 1. Bribe payers don’t go to the authorities for fear of getting punished themselves. 2. That bribe takers actually get punished when corruption is reported. Too often, law enforcement agencies fail to punish bribers, be it for lack of political will to fight corruption, lack of resources, or in the worst cases, corruption in the justice system. Legalisation would not have the desired effect if enforcement is slow and costly then the bribe payer might have more to gain from keeping quiet. He avoids the costs and hassles of reporting the offence and doesn’t ruffle anyone’s feathers. Worse still – what if the enforcement authority is in the habit of taking bribes? Police corruption is a global phenomenon. People in 31 of the 100 countries we surveyed said the police were the most corrupt institution in their country. 63 per cent of Indians who came in contact with the police were asked to pay a bribe. In Bangladesh 64 % of citizens who had dealings with the courts paid a bribe in the process. In this context, it looks unlikely that risk of punishment for the bribe taker will increase as much as Basu predicts – meaning that officials probably won’t feel too anxious about continuing to pocket handy cash bribes. Once it is clear that a bribe giver has immunity from bribery law, many more people will be willing to give bribes. Bribe takers and bribe givers alike will not change their conduct if governments don’t enforce the anti-bribery laws essential to the fight against corruption, and that enforcement authorities act effectively and independently. It makes sense to try and change behaviour rather than just make laws, but the legalisation argument doesn’t work if the laws don’t have teeth in the first place. Do you think your country’s enforcement authorities are up to standard? Do you feel like you can trust your policemen, judges and politicians to fight corruption? Share your views in the comment space below.